Neosporin is a good way to treat pimples that look like ordinary acne that are not really caused by acne bacteria. But it won’t get rid of acne for good. Neosporin has no effect on acne bacteria. Neosporin is a combination of three antibiotics that fight skin infections caused by staph and strep bacteria. Neosporin is useful for treating “pimples” that contain clear, yellow pus. These are usually caused by staph bacteria. Neosporin is also useful for treating blisters that pop and release a sugar-like honey-colored fluid that sticks to the skin. The kinds of skin infections that Neosporin treats usually begin with a cut or scrape rather than in a pore. Neosporin has no effect on acne bacteria, and cannot reach into pores to kill any kind of bacteria that may live there. Neosporin is OK for treating small numbers of blisters, but extensive outbreaks or outbreaks that also cause infections of the throat or sinuses require medical attention. Neosporin won’t do anything for non-inflammatory blemishes on acne-prone skin, but Exposed Skin Care will. What Kind of Medication is Neosporin? Neosporin is an antibiotic. More precisely, it is three antibiotics. Neosporin is a combination of bacitracin, neomycin, and polymyxin B. They are mixed together in a base of cocoa butter, petroleum jelly, sodium pyruvate, tocopheryl acetate, and cottonseed oil. Bacitracin is an antibiotic commonly used when there is a possibility of staph infections. It works well on the body, but it works poorly in the body (except in chickens). Bacitracin by itself is most commonly use to prevent infections when the skin is tattooed, but it only kills one kind of bacteria, Steptococcus pyogenes. Neomycin is a chemical Streptococcus bacteria release to kill Staphylococcus bacteria. It won’t kill strep bacteria on the skin, the way bacitracin will, but it will kill staph most staph bacteria. Neomycin is sometimes given as a pill to treat bowel infections. It is not absorbed into the bloodstream when taken as a pill, but if it were injected into the bloodstream, it would quickly cause kidney damage. Polymyxin B is a mixture of two other compounds, polymyxin B1 and polymyxin B2, that kill bacteria by attaching to their cell membranes and making them very permeable to water. The bacterium absorbs so much water that it bursts. Polymyxin B is an antibiotic that either kills a bacterium or doesn’t. If the strain of bacteria is “gram-positive,” that is, it has a tough outer wall, polymyxin has no effect. Acne bacteria are gram-positive. None of these three antibiotics has any direct effect on acne bacteria. If anything, they will just wipe out all the other, competing bacteria in a pore so acne bacteria will be in charge. Neosporin will not kill acne bacteria but it sometimes is what is needed to clear up your complexion. Sometimes raised bumps on the skin look like pimples but aren’t. Staph and strep bacteria can cause inflammation of the skin, too. These are the bacteria that you can kill with Neomycin. Staph infections of the skin typically cause a painful, raised bump on the skin. It usually has a round yellow center of pus that makes it look and feel something like a little volcano. The main way you can tell the difference between acne and a staph infection is that acne always breaks out from a pore, and staph always breaks out from a tiny cut. Acne usually occurs on your face, and you can’t spread it to other parts of your body. Staph infections can break out anywhere on your body, and they are easy to spread with dirty fingers. There is an even more important difference between acne and staph infections that makes staph infections potentially deadly in the very young, the very old, and people weakened by illness. Acne infections don’t cause inflammation on their own. The immune system causes the inflammation that attempts to flush them out of pores. Staph infections release their own toxins, and can even clot blood. A staph infection is something you want to stop as soon as you can, and Neosporin is one way to do it. Staphylococcus aureus can protect itself from the immune system by making blood clot so white blood cells cannot reach the skin. Streptocococcus pyogenes can spread itself from one site to another on the body by interfering with clotting factors and aggregating factors in the blood so white blood cells cannot band together against it. Infections of the skin with this kind of strep bacteria can literally dissolve layers of the skin. This is the kind of reaction you see in a skin infection known as impetigo. The skin dissolves from the inside out and forms a blister. In just a few hours the blisters burst, releasing a honey-brown fluid that quickly dries on the skin. The fluid spreads the infection. The kind of impetigo caused by strep infections can cause intense itching but does not leave scars unless the skin is treated too aggressively. This kind of strep infection on the skin can even resolve on its own, but it can also spread inside the body to cause strep throat and scarlet fever. Untreated blisters on the skin can also cause permanent enlargement of the lymph glands nearest the blisters. There is also a kind of impetigo caused by staph bacteria. This skin infection originates in the nose. Staph bacteria from the nose and sinuses are spread onto the skin by mucus. They also cause blisters, but these blisters do not easily burst. After 2 or 3 days they may release a thin, yellowish or clear liquid. The blister deflates from the middle out. This kind of impetigo usually does not cause permanent activation of the lymphatic system. Since Neosporin kills both of the kinds of bacteria that can cause impetigo, it is good thing to keep on hand, especially if you have small children. But you should only treat impetigo on your own if you manage to catch the infection when it has just caused one up to three or four tiny blisters. If you are treating just a few blisters, apply Neosporin and wash your hands thoroughly. Then loosely bandage each blister and wait for them to pop. Remove dead skin with warm water and a soft washcloth you throw away after use. Don’t pick at the blisters. If you are treating a child who has impetigo, make a game of wearing gloves or mittens so they will not pick at the infection and spread over the rest of their bodies, or other children’s bodies, as they sleep. Clean all clothes, bed clothes, and towels in hot water. Neosporin can’t treat severe cases of skin infection caused by strep and staph. If there are multiple blisters, or if there are any signs of sinusitis or sore throat, see a doctor. There are medications for impetigo that will not cause side effects, although they tend to cost more. A topical medication called mupirocin may control infection so that oral antibiotics do not have to be used. What About Neosporin for Everyday Acne? Neosporin may be just what you need when you have staph or strep infections. It really is not of much use for acne. None of the antibiotic components of Neosporin fights acne bacteria. These antibiotics are most useful for bacteria that do not have cell walls. Acne bacteria have cell walls. 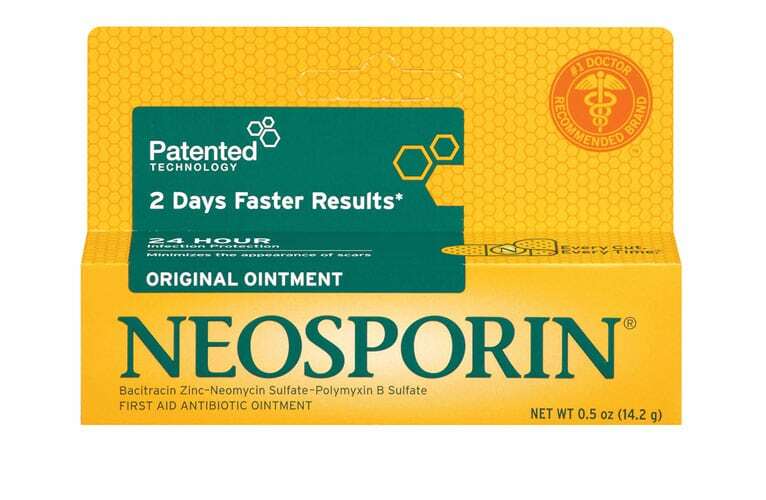 The antibiotics in Neosporin are most useful in treating bacteria that require oxygen to live. Acne bacteria tolerate oxygen, but do not require it. And Neosporin cannot penetrate deep enough into the skin to get rid of any kind of bacteria that live in the sebum-producing glands themselves. Benzoyl peroxide and tea tree oil are what you need for fighting acne bacteria. Benzoyl peroxide kills acne bacteria that antibiotics miss, and tea tree oil controls not just acne bacteria but also staph infections on the skin while it relieves inflammation in the skin. Herbal gels made with calendula fight acne, staph, and strep infections while reducing inflammation, but you need to be sure you aren’t allergic to calendula (by testing a dot of the product on the skin of your arm and waiting a few hours to see if you are allergic before putting a lot of the product on your face) before you use them the first time. And a complete acne-fighting system like Exposed Skin Care is what you need to prevent whiteheads and blackheads on acne-prone skin.